Lips with a natural tilt, length and fullness make for a more feminine and youthful appearance and smile. Longer, thinner upper lips with little or no visibility of the upper teeth are typically masculine traits. A youthful, feminine face is often characterized by a shorter distance between the base of the nose and the upper lip, with subtle visibility of the upper teeth when the face is relaxed. Over time, the upper lip tends to sag and cover the upper teeth. In regards to the vermilion (red area), it is considered more feminine when there is a certain volume and projection. The lip is partially turned upwards, making the vermilion area more visible. The resulting curvature increases the lip projection. The upper teeth are also exposed around 3 or 4 mm. The incision is partially hidden in the nostrils. If, despite surgery, the lip is too thin, we can inject a filler material during or after surgery. This can be done with temporary fillers or by fat transfer (injection of fat taken from the patient). The effect of the injection, mainly placed in the inner side of the lip, directly below the intra-oral mucosa, is an augmentation in volume. A small percentage of fat grafts are reabsorbed, but the majority will be permanent. The filler product, hialuronic acid, is reabsorbed slowly, so the treatment would need to be repeated approximately every 6 months. 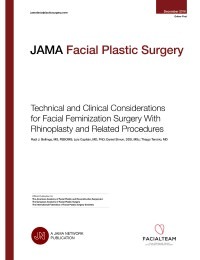 Technical and Clinical Considerations for Facial Feminization Surgery With Rhinoplasty and Related Procedures.